All in stock, please call for more info. The Aquatec F is equipped with an optimally designed bottom plate which allows for more space in the bathtub. 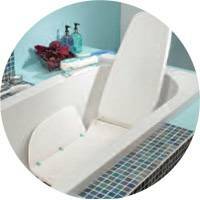 The Aquatec R is a reclining back bath lift with the ability to recline to 40 degrees. The Aquatec SRB is equipped with special laterals for a more safe and comfortable fit. The Aquatec XL offers a weight capacity of up to 170 kg (375 lbs.). 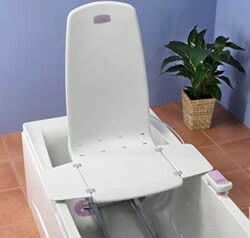 Description: The new Neptune Reclining Bath Lift is ideal for people who have extra positioning requirements. Description: The Neptune bath lift offers a practical bathing solution allowing the users to retain their independence by providing the ultimate in safety, comfort and reliability. A stylish and lightweight actuator-driven bathtub lift that provides maximum support and comfort for the user.